Dining is an integral part of campus life and a major contributor to a positive student life experience. Food brings us together. We all have fond memories of meals shared with family and friends. Many of our stories of college involve the food and the meals we had with classmates and faculty. Lifelong friendships and working relationships are formed and deepened while sharing a meal. Long gone are the days of “mystery meat” served up in a long and impersonal tray cafeteria line. Today individual choice, variety in wholesome, locally sourced, sustainably grown food, and a transparency in preparation are critical. The campus dining commons is a place to come together, to meet friends and faculty, to share questions, observations and conversations; it is the place where contemporary hospitality and education are combined to foster community. Union Street Gastro Pub in SFO’s International Terminal provides a variety of places for patrons to relax and share a meal. Communal tables create opportunities to meet fellow travelers to make unexpected connections. We have all come to expect a diversity of spatial environments - to see and be seen, to be alone, together and alone together. Students, faculty and staff are looking for places that will encourage engagement, spark creativity, build community, and promote health and wellness. Similarly, there is an expectation for connections to the outdoors that support inspiration, excitement and overall well-being. The character of the space is just as important as how the space is used. Natural daylight and a strong connection to the outdoors creates a strong positive student experience. Contemporary consumer expectations, shifting social norms and the influence of media are among the long list of factors that are driving change in campus dining. Commercial and hospitality environments are designed to create experiences, reflect the fabric and texture of places, and support a person’s brand affinity. 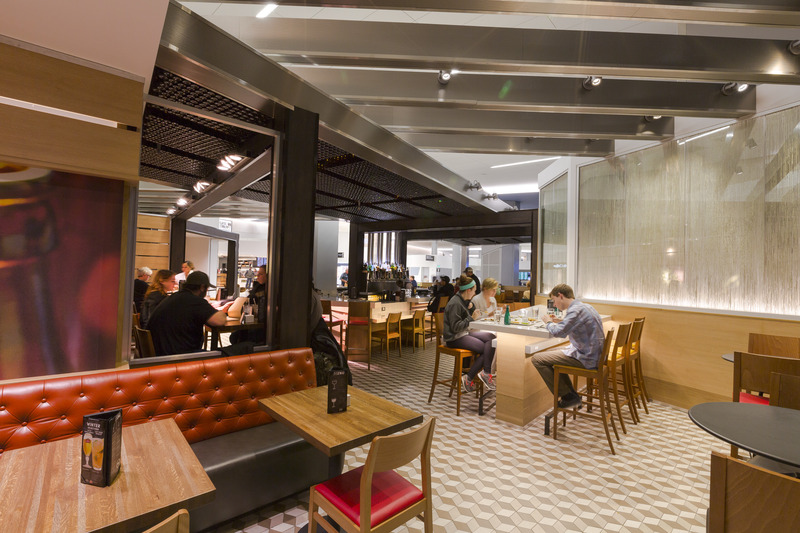 A synchronous example of the shift on campuses is the changes in dining experiences in airports. 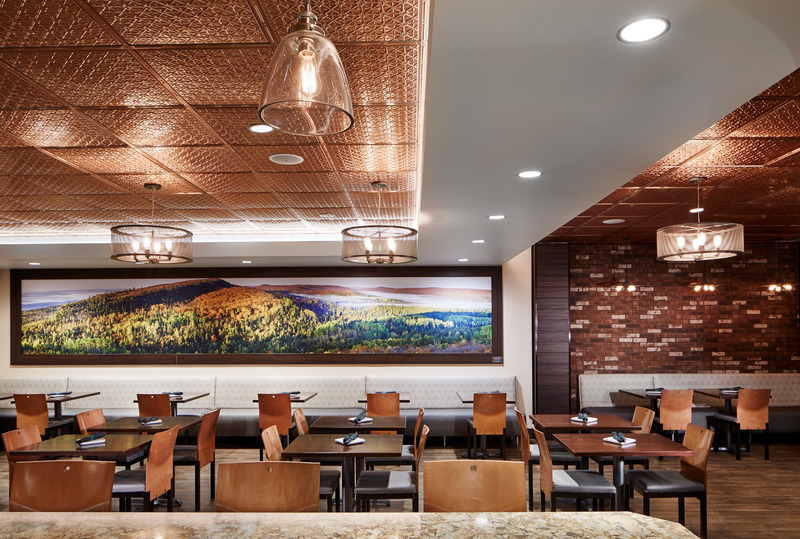 Once uninspired and indifferent, dining in airports across the US has become more option-packed and individualistic. Quick service doesn’t equate to bland, unhealthy or unremarkable; airports are using the “captive audience” as a way of competing for market share (giving you a reason to prefer flying through one location vs. another) and providing a sense of a location’s culture and character. A quick overview of the Dining Service web pages of a variety of colleges and universities reinforce the expectation for healthy, locally sourced, sustainable food choices served in a welcoming environment. The University of Vermont emphasizes mindful eating and equips students with information on making smart choices - for their health, for their community and for their planet. Princeton University began a pilot program that started in Fall 2017 that donates excess food from its dining halls to a local nonprofit that serves working families. The changes in campus dining are driven by social, economic and generational trends. The “Menus of Change University Research Collaborative” promulgated by The Culinary Institute of America and Stanford University strives to realize a long-term, practical vision integrating optional nutrition and public health, environmental stewardship and restoration, and social responsibility concerns within the foodservice industry and the culinary profession. Over 42 colleges and universities have embraced its tenets and are members of the Menus of Change University Research Collaborative.